There is an area in the south western part of Nova Scotia that is affectionately referred to by the locals as "The French Shore", approximately 40-50 miles from where we live. 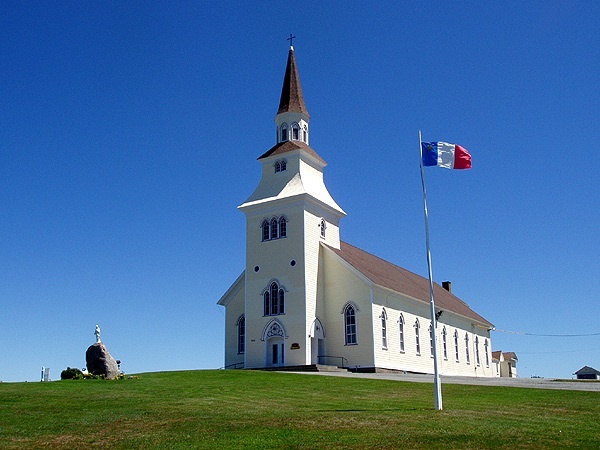 The spirit of l'Acadie runs deep in Nova Scotia. As one of the province's founding cultures, there are numerous reminders of the French settlers who first claimed Nova Scotia as their home in the seventeenth century. While driving through the Acadian Shore region, you will pass through several French-speaking villages and will marvel at the soaring beauty of the Acadian churches, one of which is Sacred Heart Church or l'Eglise Sacre Coeur located in Saulnierville, Nova Scotia. You might be asking yourself where I am going with this story. Please read on as I explain. 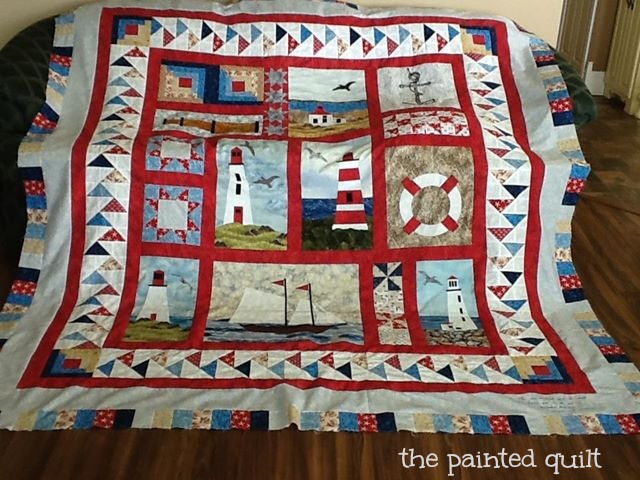 Quilting and quilters know no boundaries and as we all know, can be found throughout the world, including the Acadian Shore of Nova Scotia. 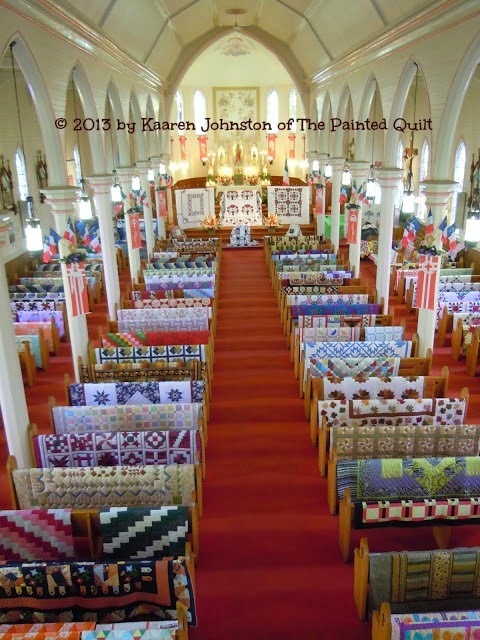 Three short years ago La Guilde Acadienne de Clare was formed and with a lot of hard work and dedication to the craft, the founding members decided to organize and host an annual quilt show and sale in the Sacred Heart Church. On Sunday afternoon I dropped off five of my quilts to be included in the display. Today, Mr. Painted Quilt, Ollie and I made the trip up the French Shore to visit the show. Here is the breathtaking view taken from what used to be the choir loft. A virtual sea of over 200 quilts in every color of the spectrum...and all locally made! EDIT: I have added a copyright watermark to the above photo because people have been using it without my permission for their own personal gain. 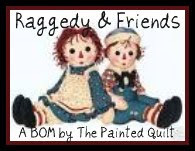 I have specifically stated on the sidebar of my blog that I am very approachable and easy going and have never refused anyone who has asked permission to use any of my photos, written material or free patterns. Having said that, I do get kinda miffed when people just assume that they can lift or copy my personal property without asking. Below is one of the guild members in traditional Acadian attire. The quilts on display were stunning. And do you recognize this one? It's my friend Debra's version of Safe Harbor! 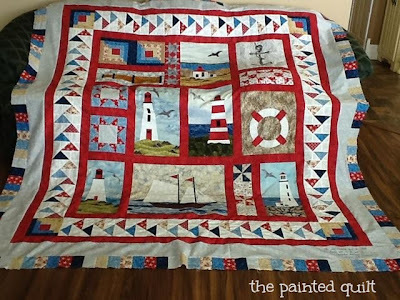 And while I'm on the subject of Safe Harbor, I was speaking with my friend and longarm quilter Alice just this afternoon and my Safe Harbor is on it's way back to me as I write this. With any luck it should be here by Friday and you know that I will start to bind it as soon as soon as I tear open the box. I'm hoping to have the patterns ready for sale in my Etsy shop within the next two weeks, so please bear with me. If you're in the area this week, treat yourself to the show. This year the dates are July 29 - August 2nd. There are even a few quilt shops in the area that sell fabric at great prices and sewing machines too! And if you can't make it this year, why not think about attending next year? Nova Scotia is a wonderful place to visit and an even greater place to call home. The scenery is spectacular, the people are the friendliest on earth and the seafood is to die for! So when are you coming? Note* If you'd like to read more about the Acadian culture, just click HERE. I was trying to exercise patience while waiting for my Gentle Art Schnibble quilt to arrive back home. Today was my lucky day! Immediately after taking it out of the envelope, I prepared the binding and sewed the last stitch about 20 minutes ago, with a little break for dinner in between. Last month Mary from Quilt Hollow was offering a special to quilt this little table topper with an all over needle, thread and spool of thread design. Can you make it out? Too cute! This is only the second Schnibble that I've made. The first was Picnic and Mary quilted that one for me as well. It has a permanent place on our dining room table. Back in 2010, Mary and I decided upon a barter...she would quilt my Picnic flimsy and I would send my newest prairie doll creation, Persephone, to live at her house. If you'd like to read more about it, click HERE and HERE. In the interim, I've been diligently writing the instructions for Safe Harbor. I'll be sure to let you know as soon as it's ready. It's been a while since you've seen Ollie and he is certainly becoming a handsome dude. We celebrated his first birthday on the 6th of June and for a puppy his age, he has become a well behaved and constant companion who comes everywhere with us. I think I woke him up from his afternoon nap when I took this photo. Oops! Whew! I finally caught myself up with Darlene's mystery quilt. I was almost two months behind so when Darlene released the checkerboard border to us at our guild meeting last week, I decided that I'd better get a move on. The final stitch was completed about fifteen minutes ago. There is one final row to be released next month and then it'll be done. 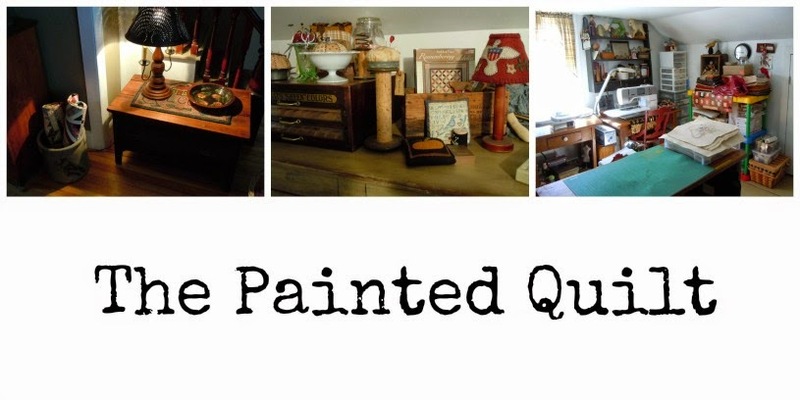 If you'd like to make one yourself, here's the link to Darlene's blog. Just scroll back through her posts until you find the introduction. 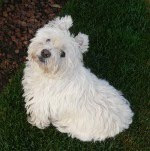 It's been a lot of fun and if you like scrappy, then you'll love this! I am diligently working on writing up the pattern. There might be a slight delay because just as Alice was about to load my quilt on the frame, her dear Mom passed away. I'm still hoping to have the pattern ready by the end of the month so keep your fingers crossed. At a recent guild meeting, one of the gals happened to bring up the subject of travel iron caddies. Since she planted the bug in my ear, I've had a compulsion to make one and just a few days ago, found a free pattern on line which seemed to suit my needs to a tee. My interest was peaked immediately because I've been doing a lot of sewing at my friend Debra's house (no blog) while she minds her home-based quilt shop over the summer months during our prime tourist season. I lug my machine and all my supplies with me...including my iron...so my new caddy will come in handy on our sewing days. After a quick trip to my LQS yesterday morning to pick up the two different types of heat resistant fabric that the pattern calls for, I was able to get down to business. Three hours later, it was all done! Funky fabric, huh? Sooooo out of my comfort zone and I even found it in my stash! A perfect fit with lots of room to spare. One of the added bonuses is that it doubles as a pressing cloth when open. Now I won't have to hang around waiting for my iron to cool off before packing it up and taking it home. With the double layer of heat resistant lining, it'll be pack-up-and-go! Here's the link if you'd like to make one yourself. 1. I cut the binding on the bias making it so much easier to apply. 2. I eliminated one of the layers of batting because one of the heat resistant fabrics had a batting kind of fabric already attached to it. 3. I spray basted between the layers to prevent them from shifting when sewing. 4. I used colored wrapped elastics for the closures ..the ones used for gathering hair into pony tails...rather than the plain 1/4" white elastic that the pattern calls for. Looks sooooo much better. 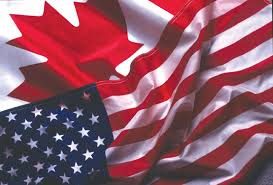 Happy Canada Day to all my fellow Canadians and an early happy 4th of July to all my fellow Americans. Having spent half my life growing up and living in both countries, I'm proud to say that I celebrate the two holidays simultaneously and with equal patriotism and exuberance! 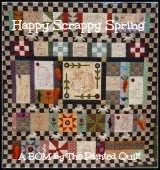 July 1st also means that it's the first day of the month and the day to release the 4th row of my Happy Scrappy Spring BOM. Only one more row to go after this month so if you've been keeping up, it's down-to-the-wire time now. It's hard to believe that when I took this photo in our back yard a few months back, the leaves weren't on the trees yet. My how time flies! To download the Row 4 PDF file which includes the instructions, line drawings and photos, please click HERE. Have fun and as always, enjoy!